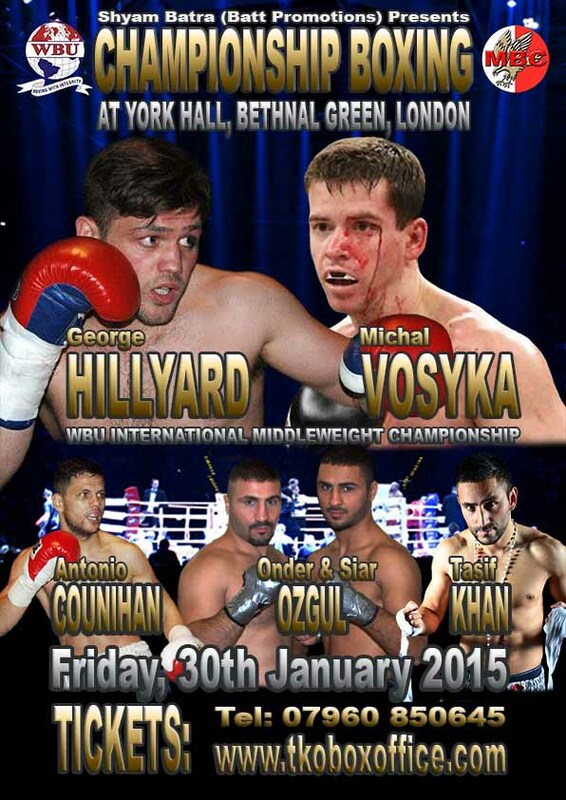 London – Thursday, 22nd January 2015 - On Friday 30th January boxing fans in London will once again be making their way to the famous York Hall in Bethnal Green, London for the first pro boxing event in the Capital of the New Year – the Shyam Batra promoted ‘Legends and Prospects’, headlined by the Hillyard-Vosyka for the WBU International Middleweight Championship. A large majority that will be making their regular pilgrimage to the shrine of the pugilistic arts in the Capital, will be doing so to support two Hackney based, Turkish born youngsters, Siar and Onder Ozgul. Over the past year or so the brothers have been building quite a reputation for themselves, as two of the most exciting, all action fighters in the Capital, their fan base has been growing at an incredible rate, so much so that as soon as it is announced they will be boxing on an event, their ticket allocation is usually sold out in a matter of days. So just what makes these two lads so special and such a draw for fight fans you may ask, well for a start the older of the two, Onder, was dubbed ‘Little’ Mike by the Turkish fight fans back in his homeland, as he has is likened, fight style, to a certain ‘Iron’ Mike Tyson. He was a regular member of the Turkish team that competed on the ‘World Series Of Boxing’ circuit, as well as racked up a numerous national and international accolades as an amateur. Younger sibling, Siar, who also has a trophy cabinet crammed to the gills with the trophies and medals from his amateur career, is a little more refined in his boxing style, but still as with Onder presents an incredible forceful style of boxing that his opponents find very hard to cope with. With five top class wins already under his belt, young Siar is the first to be stepping up to six rounders, as his team begin focusing on preparing him for the rigors of Championship boxing in the near future. Following a normal day at the office, at the recently rebranded Champions TKO Gym in Hackney, Onder, Siar and their well known coach, former Commonwealth Lightweight Champion Mo Hussein, took a little time to talk about their upcoming fights as well as what the future may hold for the young stars. Onder was the first to speak, “I’m comfortable with my training, I’m feeling really good and I’m determined to give a very good performance. I don’t know about my opponent, I know he will come to fight and that is good for the fans, I’m ready for him and that’s good for the fans. I’m ready to move forward, I came to England to fight for titles, I want to fight for titles that’s why I box, in the past things have happened that stopped me progressing but now I’m ready. I’m not looking to be just an area champion, I want to be British, European and more than anything to be the World Champion. When I am training that’s in my mind, train like a champion, I have big targets, I will be Champion. The highly affable Siar then spoke, “I have no problems moving up to six rounds, I was ready for six rounds before. Now the opportunity has come up I’m very comfortable to do six rounds, even when I boxed at Light Middleweight, now I’m Welterweight I’m more ready than ever. My aims are the same as Onder, I want to be World Champion, I will fight the best I can and earn the right to fight for titles. God willing I will get the chance to fight for a title this year, English or International, I don’t care I just want to fight for a title as soon as Mo (Hussein) says I’m ready. I’m ready for whoever they put in front of me to fight, I’m ready, no problem. Finally a smiling Mo Hussein spoke briefly about his young charges. “My thoughts on the two boys is I think they are both excellent prospects, I think the sky’s the limit and they are going to go all the way to the top. They’ve already proved themselves, they train hard, they fight hard and live the life, there’s nothing to stop them. Onder Ozgul versus Karel Horejsek and Siar Ozgul versus Vladimir Fecko will feature on the Shyam Batra promoted ‘LEGENDS & PROSPECTS event, headlined by George Hillyard versus Michal Vosyka WBU International Middleweight title clash, that takes place at York Hall in Bethnal Green, London, on Friday, 30th January 2015.